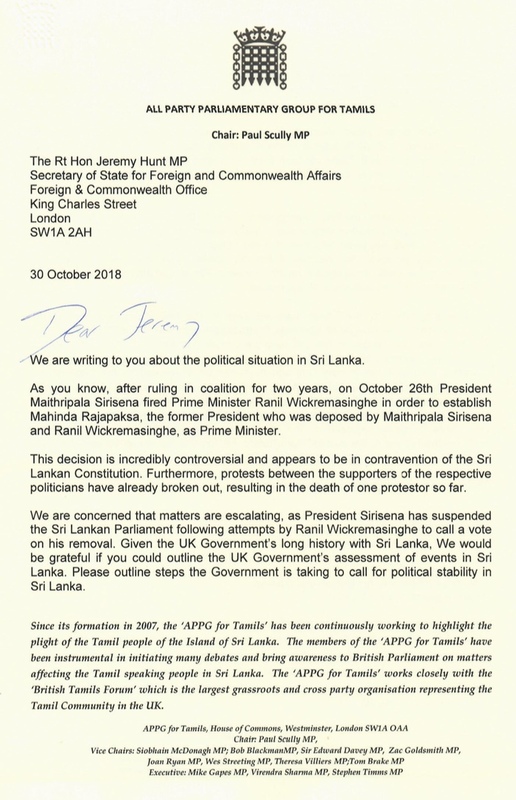 A cross party group of British MPs, the All Party Parliamentary Group for Tamils (APPGT) have urged the UK government to take urgent action over the Sri Lanka's unfolding crisis following the sacking of the prime minister, Ranil Wickremesinghe and appointment of the former president, Mahinda Rajapaksa in his place. In a letter to the British foreign secretary, Jeremy Hunt, the APPGT questioned what action the government had been taking to ensure political stability on the island. "Given the UK Government's long history with Sri Lanka, we would be grateful if you could outline the UK Government's assessment of events in Sri Lanka. Please outline steps the Government is taking to all for political stability in Sri Lanka. Please can you also outline what discussions have been helf with international counterparts regarding these events, and we would in particular like to know if this issue has been discussed with the Chinese and Indian Governments?" "We therefore believe that it is vitally important that the UK Government a widespread outbreak of violence and we would therefore like to know if you have any plans for either yourself or the Minister of State for Asia and the Pacific to address the House at the earliest opportunity. Failing this we would be grateful if you could meet with Parliamentarians on the APPG for Tamils to discuss this matter."